No, no no, and again: no! The Earth would NOT look like this without water. Please stop sharing this nonsense. The image above actually shows Earth’s gravitational field, and the variations in this geoid height are thousand times exaggerated. 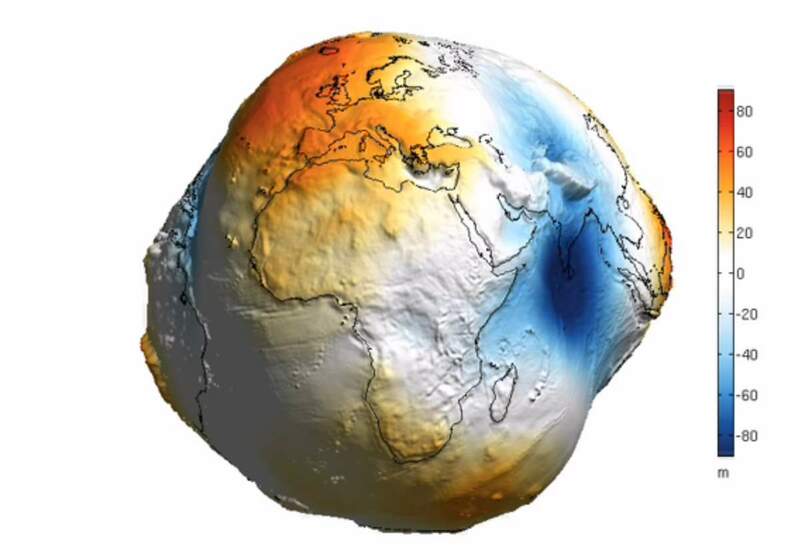 The image above is actually shows Earth’s gravitational field, and the variations in this geoid height are thousand times exaggerated (“Earth potato”), in reality the Earth’s shape is very close to a sphere (for more details, see the reference paper). It is produced with MATLAB, and the original title is “MATLAB script for 3D visualizing geodata on a rotating globe”. MATLAB (matrix laboratory) is a multi-paradigm numerical computing environment and fourth-generation programming language (Wikipedia). You can see the original paper by clicking here. All Earth’s water, liquid fresh water, and water in lakes and rivers Spheres showing: 1. All water (sphere over the western U.S., 860 miles/1384.04 km in diameter) 2. Fresh liquid water in the ground, lakes, swamps, and rivers (sphere over Kentucky, 169.5 miles/272.78 km in diameter), and 3. Fresh-water lakes and rivers (sphere over Georgia, 34.9 miles/56.17 km in diameter). Credit: Howard Perlman, USGS; globe illustration by Jack Cook, Woods Hole Oceanographic Institution (©); Adam Nieman. 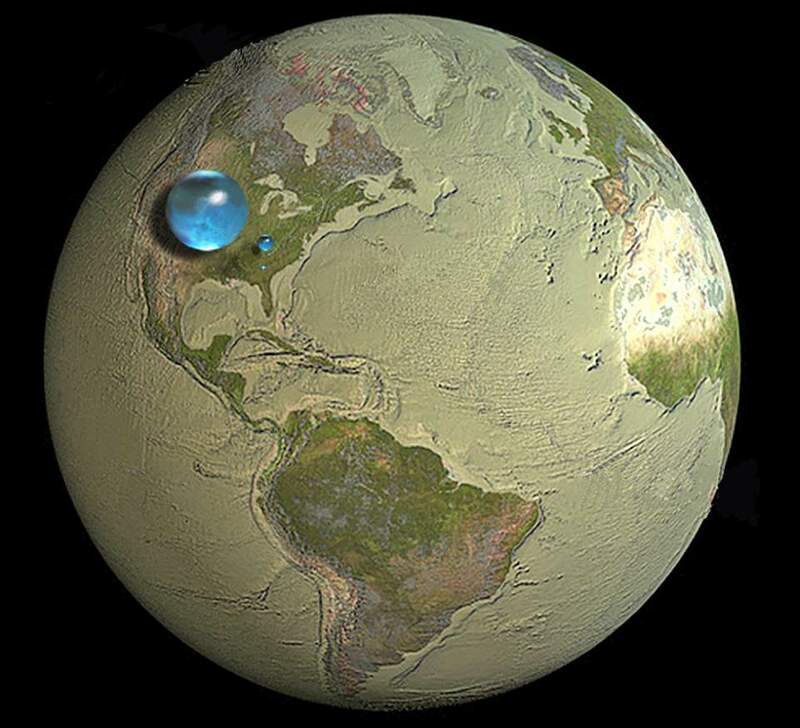 The drawing above shows blue spheres representing relative amounts of Earth’s water in comparison to the size of the Earth. Are you surprised that these water spheres look so small? They are only small in relation to the size of the Earth. This image attempts to show three dimensions, so each sphere represents “volume.” The volume of the largest sphere, representing all water on, in, and above the Earth, would be about 332,500,000 cubic miles (mi3) (1,386,000,000 cubic kilometers (km3)), and be about 860 miles (about 1,385 kilometers) in diameter. The smaller sphere over Kentucky represents Earth’s liquid fresh water in groundwater, swamp water, rivers, and lakes. The volume of this sphere would be about 2,551,000 mi3 (10,633,450 km3) and form a sphere about 169.5 miles (272.8 kilometers) in diameter. Yes, all of this water is fresh water, which we all need every day, but much of it is deep in the ground, unavailable to humans. Did you notice the “tiny” bubble over Atlanta, Georgia? That one represents fresh water in all the lakes and rivers on the planet. Most of the water people and life on earth need every day comes from these surface-water sources. The volume of this sphere is about 22,339 mi3 (93,113 km3). The diameter of this sphere is about 34.9 miles (56.2 kilometers). Yes, Lake Michigan looks way bigger than this sphere, but you have to try to imagine a bubble almost 35 miles high-whereas the average depth of Lake Michigan is less than 300 feet (91 meters).